My mother was an artist, so I grew up in a house piled high with paints, canvases, easels, glazes, frames, art books and more. In fact, when I moved out of my parents’ house in the late 90s, she turned my bedroom into her art studio. I’m writing in that room now, and I can feel her creative mojo here still. While my mother worked in paint and ceramics (and sometimes music notes), I work in words. But honestly, no matter the medium, the struggles are often the same. My husband is a chef and my son is a songwriter. We all still get blocked creatively sometimes and get nervous when someone views our work. 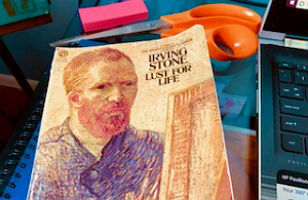 I recently finished reading Irving Stone’s Lust for Life. Published in 1934, the novel is a fictionalized account of Vincent Van Gogh’s growth and struggles as an artist. Van Gogh dabbled in other professions before becoming obsessed with art and pouring hundreds of hours a week into honing his craft and trying to find his unique artistic voice. Quite simply, it drove him mad. He ran his hand upward over his chest. Many resources recommend writing what you know. I agree, to an extent. As creatives, we must also grow outside our walls, our comfort zones, our experiences to bring in new inspiration – and a little whimsy. What books have inspired your work? What phrases speak to your craft?